Marina Pez Vela lies in the shadows of Manuel Antonio National Park overlooking Quepos and the Pacific Ocean. Quepos sits on the coast line just three hours southwest of San Jose, Costa Rica and is an easy drive on nice roads. Last month this quiet community was busting at the seams with 67 teams of tournament anglers from 30 countries all competing for the title of World Champions. The Offshore World Championships are the “ Crème De La Crème” of all offshore tournaments where the best of the best come together to showcase their skills. 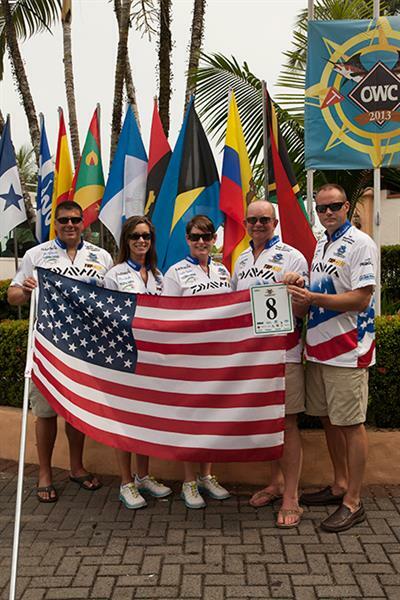 Anglers from places such as New Zealand, Australia, Croatia, Italy, Bahamas, Brazil, Argentina, Panama, Guatemala, Angola, Africa, USA and other countries all gathered at the Parador Resort for the opening ceremonies. The language barrier between countries is no big deal when fellow anglers get together because the language between fishermen is pretty universal and with a few hand signs anglers and boat operators pretty much know what each other wants or is meant. After months of anticipation and planning Team Bad to the Bone, representing the Oregon Tuna Classic, arrived in Quepos and got settled into Casa Carolina, our base of operations for the next 8 days. Casa Carolina is one of Manuel Antonio´s most exclusive vacation rental home. Perched on a hilltop with beautiful panoramic ocean views, Casa Carolina is without a doubt in a class of its own. The breathtaking sunsets from the infinity pool and fully equipped outside grill area will inspire you and take you to a new level of relaxation. Here, as well as from the balconies of three of the suites. After a day on the ocean the pool was a welcome place to retreat with a drink and unwind. Willy Jimenez is the concierge manager of this 5 star retreat and he was always somewhere close by if we had a need for anything. 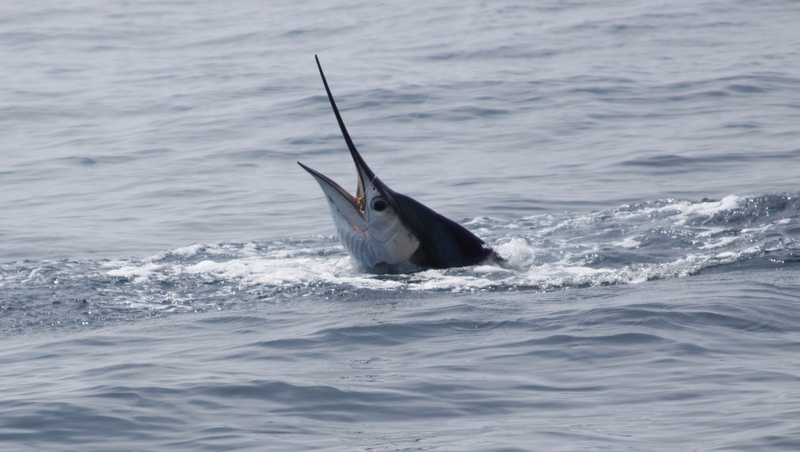 Our first two days in Quepos were scheduled for pre-fishing and the crew of Swordfish did a nice job working with us to get the bite down properly for the bait & switch technique we would be using. A beautiful greasy flat ocean and 85 degree weather with a slight breeze turned out to be the norm every day. Day one of pre-fishing yielded a world class trophy for Weddy when she landed a 68” Dorado that weighed well over 80 pounds. The mate pulled the rod out of the holder and handed it off which precluded it from qualifying for the IGFA record book but still an amazing trophy that will be replicated and hung on the wall in our home in her honor. The current IGFA world record is 68” and 88 lbs. 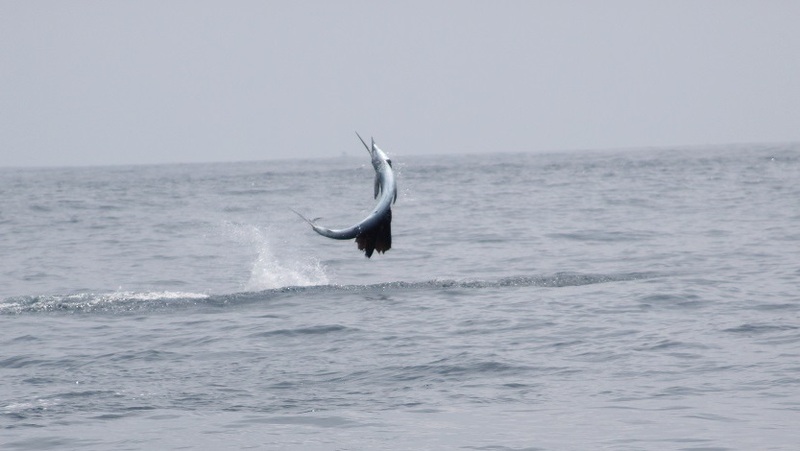 The next day we joined the crew of Fast Trac and continued practicing and with the excellent coaching from our mate, Rudy, we went 7 for 10 on sailfish. Rudy had a unique way of rigging his ballyhoo that created a bubble trail and raised fish extremely well. He was very proud of the technique he had developed which showed in the way he went about his business as a mate. I would’ve liked to have had him rigging our baits every day. We later learned he had a good reputation as a top producing mate which was no surprise. The opening ceremonies of the tournament gave you a glimpse of the monumental efforts of tournament director Dan Jacobs, his associate director Lynda Wilson and all their support staff. Having ran 4 tournaments per year with 60-80 teams I could appreciate how smoothly everything went. From the beginning it was a well oiled machine that was flowing seemingly effortless all the time. The moment you stepped on the docks in the morning they were there to great you with smiles and a can do attitude directing you to your boat for the day. They worked from sun up to sun down and I’m sure probably a lot during the dark hours. Producing a world class event takes a world class effort and what they produced was nothing short of incredible. The first day of competition got off to a rocky start when we drew the same boat as another team but within a few minutes it was worked out and soon everyone was merrily on their way. A little anxiety and few jitters was obviously present when we went 0 for 4 on fish raised and we were hanging our heads when we pulled into the dock later that afternoon. The team just wanted to go back to the house, have a drink, and soak in the pool in hopes of washing away the poor performance. Smiles greeted us again the next morning when we stepped onto the Dragon Fly. A charter boat and crew from Los Suenos with an incredible tournament winning pedigree and they showed their moxie the first day by being the top boat so we were feeling anxious to redeem ourselves with a little help from this championship caliber crew. Winning tournament teams all possess certain characteristics that get them onto the podiums time and time again. Those same characteristics that have gotten us on the podium a record number of times in the Oregon Tuna Classic were slipping through our fingers on this trip and we went 4 for 8 that second day missing on 4 other opportunities. We were tuna fishermen from the northwest and really could’ve used a few more days of practice and it showed. Sometimes a bit of good luck follows hard work and rewards those efforts but bad luck can also rear its ugly head and strike at any moment. 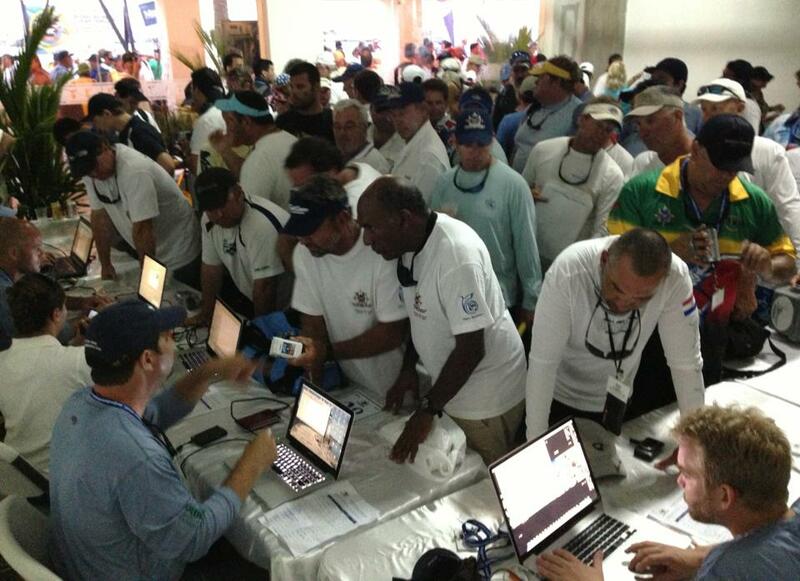 One of the things that is supposed to keep the playing field level is the format where all teams draw for four different boats and each team will be on a different boat each day. Some days a good boat & crew and hopefully nothing worse than a mediocre boat & crew on the other days but on day three we drew a subpar boat and crew. Lady luck was frowning on us. Although to the skippers credit he went in search of fish that hadn’t been pounded by the rest of the fleet. The bad part of this day was the three day old bait. The crews were required to provide fresh bait everyday but you only had to lift the lid on this boats bait cooler to realize they had not done very well on the previous two days and had a lot of old bait left leaving us handicapped on day three. On the boat ride back in that afternoon I had time to reflect on the day and gathered the team for a brief chat as we entered the marina and reminded them that in spite of not having a good day on the water we should still savor the experience of the world championships and go socialize with the other teams. Just to get to this event requires winning an IGFA qualifying event which is an accomplishment in itself and we should be proud to be standing among other champions. northwest to untouched waters. A gamble that proved to be a smart move by their crew taking them north away from the rest of the fleet and at the end of the day were rewarded with a phenomenal day. The day before they had been on the docks with their heads hanging down and in the dumps. Two days and only two fish to show for their efforts but the third day was their day and they took full advantage of fish that had not been pounded catapulting them up the leader board into 14th position at the end of day three. Highs and lows was beginning to be the norm for us as well as them. Their big day gave us some hope for the fourth and final day seeing how things can change so quickly. A few drinks, a soak in the pool and an early dinner that night before everyone retreated to their beds around 8pm. We were all a little anxious and a little on edge hoping to have a good day on our last try. More smiles from Dan and Lynda’s crew that final morning and soon we were following the other boats out of the marina headed for what we hoped was the Promised Land. This skipper ran northwest in the direction of where our Washington buddies had been the day before giving us even more hope. Soon we were positioning our ballyhoo out behind the boat close to the teasers. No one got very far from the rods as we all perched ourselves on the gunwales or somewhere worthy of a seat close to the action. The routine was pretty much the same that morning lathering sunscreen all over any exposed skin to protect ourselves from the intense sun. The attitude and intensity of our team was ratcheted up a notch as we wanted to have a good showing on our last day. Zzzzzzzzzz….The baits had only been in the water a short time when the line on the shotgun rig popped off the release and the reel went to singing. I was the closest to the rod and grabbed it in one fluid motion turning the clicker off while pointing the rod at the fish and allowing it to free spool feeding it line. One thousand one, one thousand two, one thousand three, one thousand four, one thousand five, one thousand six and I started moving the leaver drag up into the strike position praying the fish was still there. “Hooked up” – 150 yards out was our first fish of the morning dancing in the sun and peeling line. The skipper made a big turn in hopes of picking up another fish and soon we had the first fish of the day on video and then released. A few high fives and we quickly deployed the gear again getting back in the saddle locked and loaded. It wasn’t very long before the corner rod on my side went off and I went through the motions again hooking my second fish of the day. Anthony grabbed the long rigger rod as it also came out of the release clip. A double, things were now starting to look up but alas his fish would come unbuttoned after only a few minutes. The culprit was a drag that didn’t get checked and was too loose to get the circle hook stuck well enough in the fishes jaw. 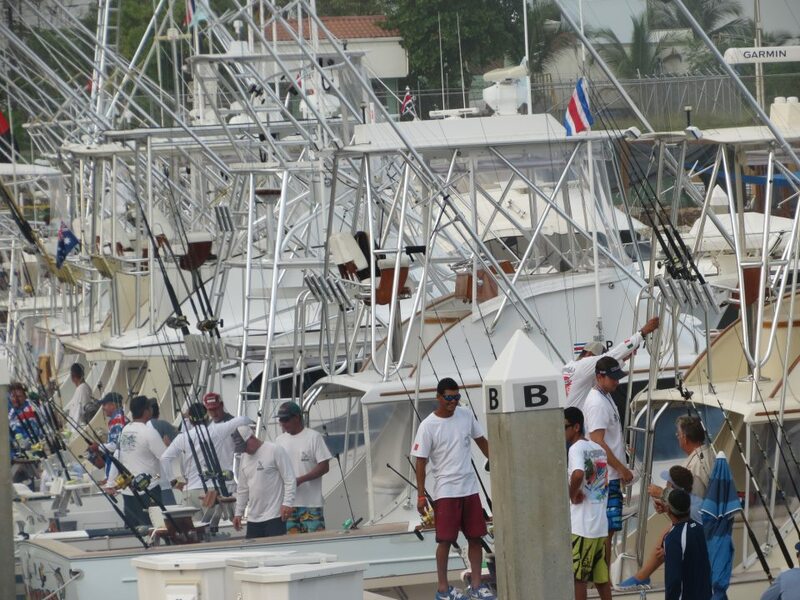 The final day ended for us going 5 for 10 on sailfish, our best day of the tournament. We had a few more samples of aged Nicaragua rum once back at the dock while our videos were reviewed and our fish confirmed. Weddy and Megan turned in our cameras and waited as they watched other teams also presenting their cameras for video verification of the species and the release. On more than one occasion they witnessed an occasional fish being disqualified for lack of good footage. We cruised through four days of competition with no fish being disqualified a testament to the quality of work Weddy and Megan did running the cameras. The crowd on the docks the last day seemed bigger as people were socializing and the pressure of the tournament was winding down. That evening we invited the guys from the Washington team to join us for dinner at Casa Carolina and sample a little of the fabulous food we had been enjoying from our cooks, Elizabeth and Soeul. Willy, the concierge manager, and Kerwin, a friend of the owners of Casa Carolina, picked up the tab and treated all of us to a great time. The next morning everyone tried to sleep in but the sounds of birds chirping had most of the crew awake and out enjoying the morning sun while laying by the pool having coffee. By 10am it was 75 degrees and raining lightly no one bothered to move. It’s not every day you can lay by a pool in the rain and not be ducking for cover. Soon our stomachs were growling and we went on the road exploring Manuel Antonio looking for a good place for lunch. The Al Avion restaurant turned out to be a unique oasis of interesting décor with a great view of the ocean from high on a hillside. Al Avion had a World War II American bomber inside the establishment sporting a bar inside the fuselage. The good size lunch crowd inside was indicative of the good portions and great food. The awards dinner and closing ceremonies were even more spectacular when they crowned a team from the Bahamas as the new world champions. A team that had been to this dance before and knew what to expect. They had practiced for nine months prior to their arrival and were rightfully reworded for their efforts. The evening culminated in an impressive fireworks display worthy of 4th of July celebration back in the states. It’s hard to fully express the atmosphere and camaraderie present during this tournament but it leaves you with a very strong desire to want to come back. We finished ahead of teams that had won this competition in previous years but it definitely wasn’t the finish we were hoping for leaving us with some great memories but pondering the effort it will take to make it back for another go around. One option is to go home and defend our title or find other qualifying events to visit and compete or possibly both. 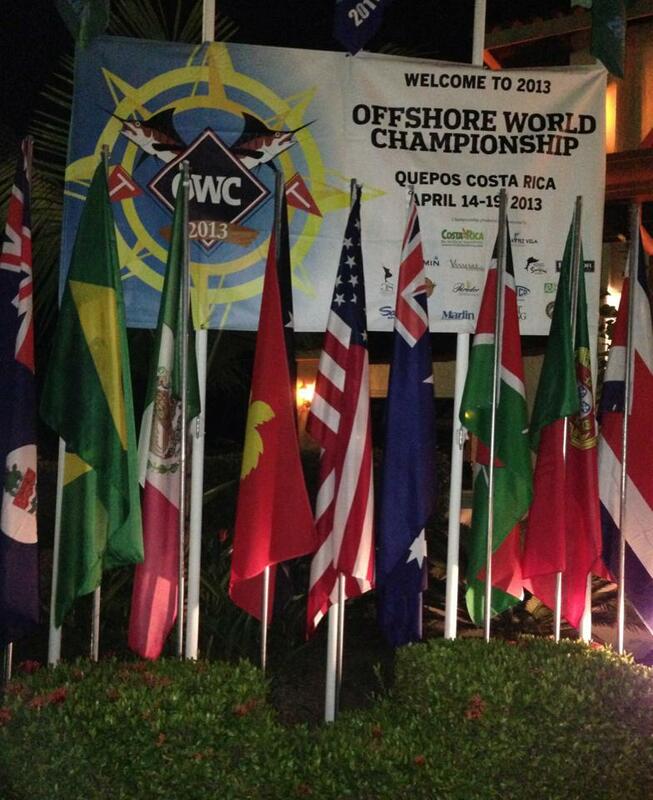 Not a bad option considering a handful of tournaments are located along this coast line in Costa Rica and Guatemala. 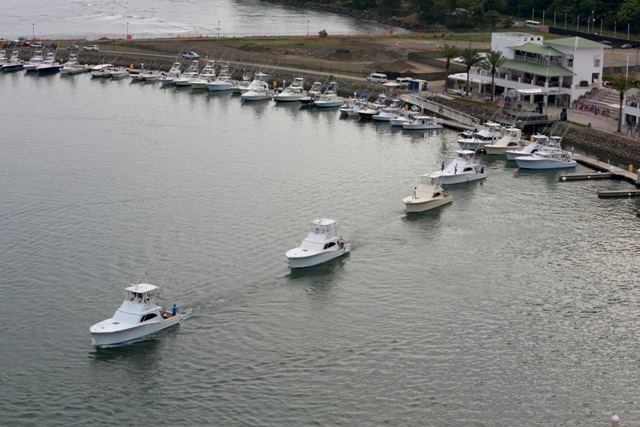 Gallery | This entry was posted in Fishing and tagged Casa Carolina, Costa Rica, Del Stephens, Dorado, IGFA Offshore World Championships, Mahi Mahi, Marina Pez Vela, Marlin, Oregon Tuna Classic, Quepos, Sailfish, Team Bad To The Bone, Weddy Stephens. Bookmark the permalink. It truly was an awesome event and we (Team Defiance-Washington Tuna Classic) were very pleased to have shared the time with all of you. 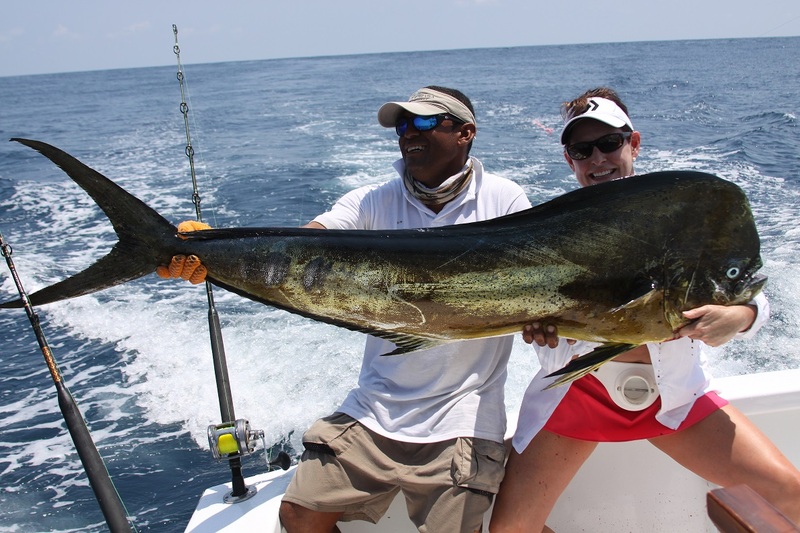 Congratulations to Weddy on that massive dorado. The dinner and evening at Casa Carolina was magnificent, and the bonus time we all spent together built our friendship to a greater level. Let’s get back there and do it again!